extended exhibition viewing: 5:30 – 6 p.m.
On Wednesday, April 20, THNOC Deputy Director Daniel Hammer will discuss the 1915 German Bazaar, an event that helped fortify a sense of community identity among the city’s German Americans. In April 1915, nine months after World War I engulfed Europe, the German community in New Orleans held a major public event to raise funds for the German and Austrian Red Cross, while also educating fellow citizens about the German war effort. The United States would not enter the conflict for another two years, and Germany and Austria had not yet become the subject of intense American pro-war propaganda. 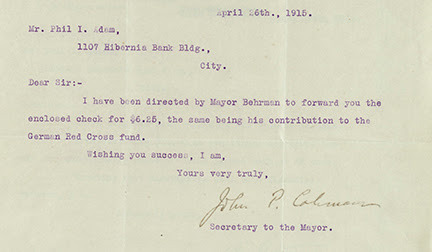 The event was supported by a number of prominent community figures, including then-mayor Martin Behrman (see above), and was a tremendous success, in part because of the city’s rich German culture. The existing documentation of the event is remarkably complete, making the German Bazaar a rare window into the life of the German American community of New Orleans at a critical time in history. Reserve your seat for the lecture today by emailing wrc@hnoc.org or calling (504) 523-4662. This entry was posted in events, French Quarter, HNOC.